Enzymes are globular proteins that serve as biological catalysts. They speed up or slow down metabolic reaction, but remain unchanged. They may facilitate the breaking of an existing bond or the formation of a new bond. Products = new substances formed. Active site = area in enzyme's molecule where the substrate bind to enzyme --> enzyme-substrate complex. The R groups of amino acids at the active site form temporary bonds with the substrate molecule. This pulls the substrate slightly out of shape, causing it to react and form products. 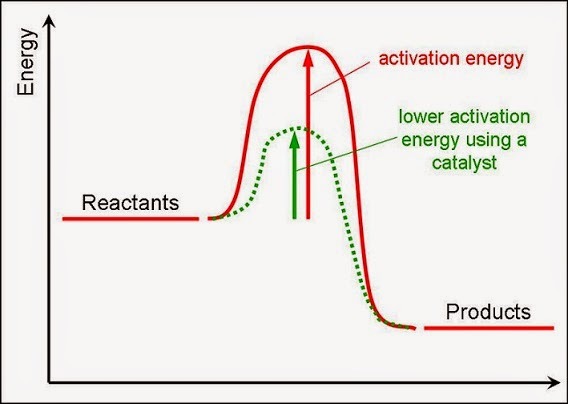 Activation energy = energy the substrates need for changing themselves into products. Heating provides activation energy. Enzymes reduce activation energy needed ---> reaction take place at low to. 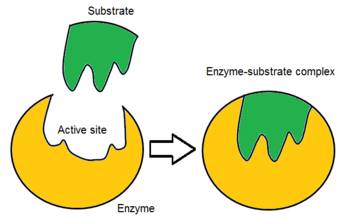 They do this by distort the shape of the substrate when it binds at the enzyme's active site. The shape of the active site of the enzyme and the substrate molecules are complementary. They possess specific 3-D shapes that fit exactly into one another. Like a key into a lock, only the correct size and shape of the substrate (the key) would fit into the active site of the enzyme (the lock). 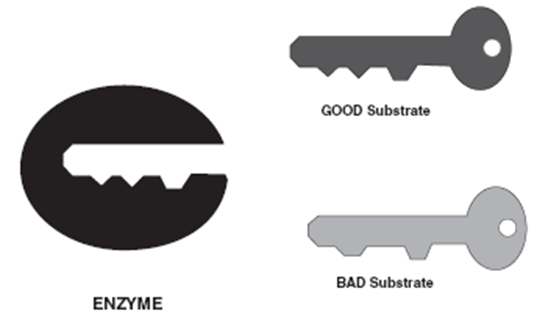 This shows the high specificity of enzymes, however it is too rigid. The shape of the active site of the enzyme and the substrate molecules are NOT complementary. In the presence of the substrate, the active site continually reshapes by its interactions with the substrate, until the substrate is completely fit into it. 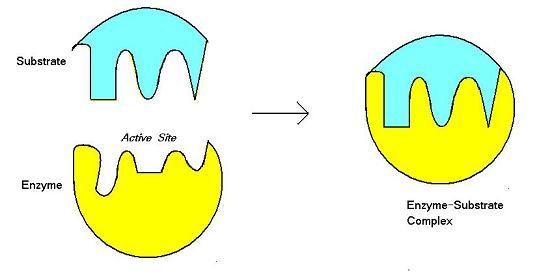 The enzyme is flexible and molds to fit the substrate molecule like gloves fitting one’s hand or clothing on a person. This hypothesis is more acceptable. to the substrate only after binding.